How do I know if ultrasonic soldering is right for my application? The ultrasonic soldering iron, without exception, can be used for all applications currently carried out by conventional soldering irons. By comparison with the normal soldering iron and its range of wattages as used in the mechanical, electrical and electronics industry, the ultrasonic iron has a digitally controlled 80 watt rating heating element which covers these ranges. It incorporates the conventional range of tip sizes, for all comparable applications. Should solder tinning requirements be required where larger surface areas need to be solder tinned, the much higher wattage UM 250 soldering system can be used. What are Ultrasonic Soldering and Ultrasonic Systems? 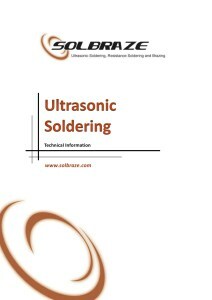 The Ultrasonic soldering process can be applied to soft soldering and other manufacturing techniques in a wide variety of mechanical, electrical, electronics and related industries. Ultrasonic soldering can be used for the soldering and tinning of conventional solder joints and a wide range of solder tinning with any form or type of ceramic materials, glass and ferrous or non-ferrous metals including copper and aluminum. With specially designed heated or unheated probes the Ultrasonic UM 250 can be used for soldering, solder tinning as well as the “mixing” of Nano Particulates. Different operating frequencies and probe designs could be designed to suit the range of other operating frequencies within the harmonic ranges. 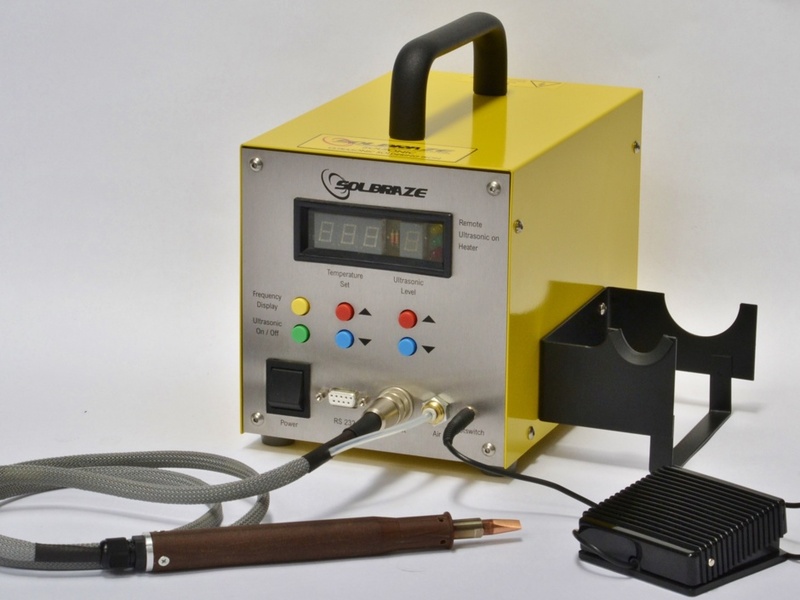 The Ultrasonic Soldering Iron is similar to a conventional soldering iron containing a normal heating element and soldering iron tip but also includes an Ultrasonic Generator and Transducer. The ‘ultrasonic amplitude’, or operating frequency, (high velocity oscillation) of the soldering iron tip enables solder joints to be made without the use of a flux (the flux being the conventional means of removing oxides from surfaces to be soldered). This enables inter-metallic wetting or bonding of soldered joints. The standard operating frequency of the Ultrasonic Iron is nominally 40 KHz. The removal of flux from a printed circuit board or a solder joint means board cleaning no longer needs to be carried out, greatly reducing cost and improving quality. The solder joint quality is dramatically improved as perfect intermetallic bonds are made using the iron. What Types Of Solder Alloy Can I Use For My Applications? Any manufacturer’s specification of leaded or unleaded alloy, including the complete range of Indium based alloys. What are the advantages of not using flux with Ultrasonic soldering? Whether you use a liquid, or a solder paste, flux will be used in conventional soldering. The composition of the flux contains an aggressive, generally acid based liquid solution, which when subjected to heat from a soldering iron tip boils as the tip temperature is in excess of 100 degrees C in order to melt the alloy. This then creates voids or microscopic bubbles in the solder of the joint/s being made. Microscopic sectioning of a typical solder joint made with a liquid flux will show these faults. This condition can result in dry joints and poor joint continuity, particularly in ultra-low current circuits, where conventional low residue non active fluxes (non-conductive types) are used. Leakage currents can still be detected after conventional soldering leading to failure of the circuit/s. With the increasing use of high density “micro” surface mount printed circuit boards, and other electrically sensitive designs the elimination of flux ensures clinically clean surfaces and avoids this possibility. What is the Ultrasonic Solder Bath on the UM250? The Ultrasonic solder bath is similar to conventional solder baths in that it is digitally temperature controlled and can be square, rectangular or round with sizes up from 75 mm diameter, to 300 x 300 mm square and up to 100 mm deep, (depending on the customer component size/s). The standard UM 250 Solder Bath sizes are 127 x 90 x 90 mm deep. The bath or solder pot, has a specially designed ultrasonic probe immersed in the molten solder where the probe or probes introduces the ultrasonic “amplitude” that activates, or imparts, the specific frequency into the molten solder. In the case of the UM250 it is nominally 20 KHz with an 80 mm wide probe. Smaller diametric probes can be used with round solder pots also permanently immersed in the solder bath. Consequently any component part/s that may be immersed into the molten solder results in “tinning” or solder coating of the immersed item. Single or multiple components can be inserted depending on the size of solder bath and the wattage of the ultrasonic generator and ultrasonic probe design. Insertion can be by free hand dipping, with or without jigging or automatic pick and place and robot systems. Flux free tinning of any component part, cables or component leads, of almost any size or diameter including IC pins and SMD devices are typical applications. The complete range of leaded and lead free alloys can be used within the ultrasonic solder bath.